In early April, the Germans renewed their efforts towards Villers-Bretonneux, a town on the high ground to the south of the city of Amiens. Through Amiens ran the main north-south rail line in northern France. Cutting the line would seriously limit the British ability to move troops and supplies. After a heavy artillery bombardment, two German Divisions, the 4th Guard and 228th, supported by tanks, launched an attack on the British lines held by the 62nd and the 8th British Infantry Division. As the German tanks advanced, panic broke out in the British lines and many of the men were taken prisoner or fell back. In spite of intense fighting, Villers-Bretonneux fell into German hands by mid-morning. The attackers then began to infiltrate the Arquenne woods and turned to attack Cachy. 2 Medals for each German tank eliminated. 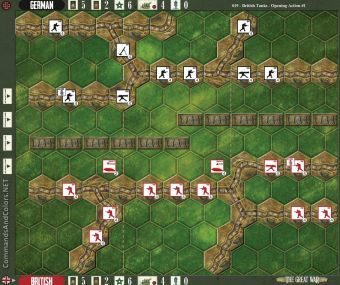 The German forces gain 1 Temporary Victory Medals at the start of their turn, for each building hex occupied. The German forces gain 1 Permanent Victory Medal for each soldier unit that exits the battlefield from the British baseline and 2 Permanent Victory Medals for each tank. 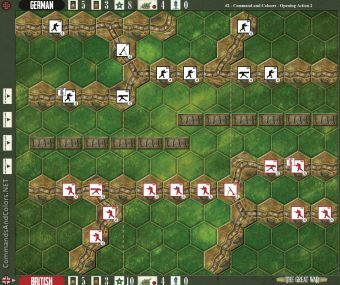 The German forces are racing against time. The British player may take a Victory Medal, instead of taking two command cards, when playing a “Recon” command card. Tags: Medals: 6, Exp#1 Tank! Outnumbered 2:1 and out-gunned, this is a difficult one for the British to win.